I bought a box of croutons and after tasting them, never repeated that action – but I have since been subjected to store-bought croutons over and over at the homes of family and friends. Sorry guys, it had to be said! I have to admit, it’s nice to have that little crunch in the salad but it can be so much better! Home-made Croutons from real bread. Crispy, chewy deliciousness! You can toss out home-made croutons in minutes. Just use a little leftover bread, a little olive oil. Add some garlic, a few herbs, maybe a sprinkle of cheese if you’re inspired. They taste amazing, cost pennies, and if you’re using leftover bread, prevent waste. Why would anyone want to pay so much more for a package of them when these are so good? If you’re like me, you’ll look at the amount of oil and think it’s too much – and you’ll cut it back. Having made these for years, I can absolutely attest that you’ll realize it’s not enough, You’ll have to start adding oil and you’ll end up using more than the original. Home-made Croutons from real bread. Here the bread was torn into pieces – lots of nooks and crannies to crisp up. Pan Frying: Requires a little more attention and the croutons absorb more oil but they (duh!) taste the best. Crunchy on the outside, a little chewy on the inside makes them just about addictive. Oven Method: Uses less oil, and doesn’t have to be watched as intensely. These turn out hard and crisp, a little more like store-bought. Homemade croutons, stored in a plastic container or a plastic bag, last several weeks, unrefrigerated, depending on how dry and crisp they are. The baked seem to store a bit better. Don’t worry, though, about storage – they’re always gone way before then! Plus, you can make as few or as many as you’d like. For either method: Cut or tear bread into cubes or rectangles. If cutting, just stack and slice. Anywhere from a half-inch to an inch or so is a great size, so go petite or large – it’s up to you. The larger ones tend to give a softer interior, and smaller ones easily crisp all the way through. Oil: I prefer to use olive oil, but any oil to your taste is fine. Herbs: Good herb choices are basil, thyme, rosemary, oregano, parsley or chives. Garlic powder may be used. Other seasonings: Just about any powdered spices could be added to croutons – cayenne, smoked paprika, any flavor profile one might like. Cheese: Any hard cheese is a good choice, so don’t feel limited to just Parmesan. Heat a skillet on medium heat. Add the oil and heat. Once the oil is hot, toss in the breadcrumbs, immediately tossing and turning around to coat with the oil. 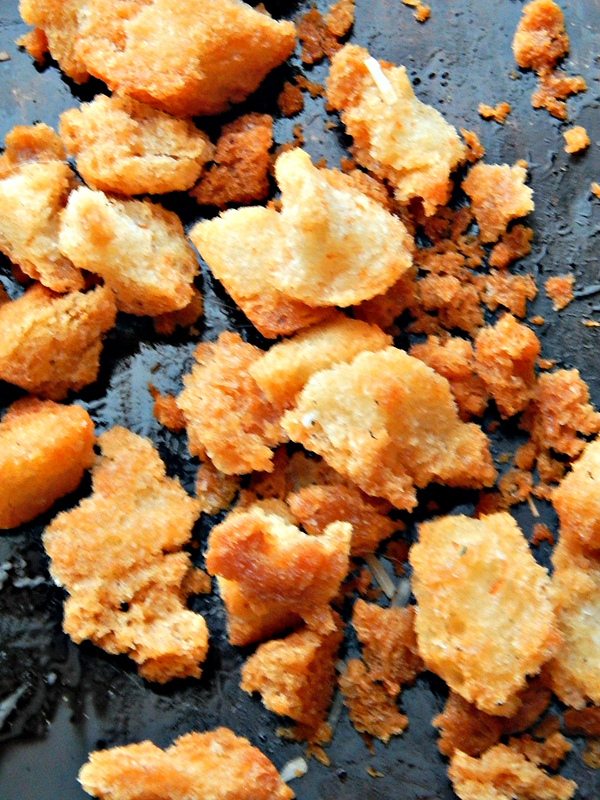 Saute, allowing them to crisp, tossing frequently to prevent burning. When about halfway done, add the garlic if using. Watch like a hawk, nudging any individual croutons over onto their unbrowned side, and don’t be afraid to scoop some onto a plate if it looks like they are done, then drop any unbrowned on one side back into the skillet on that side only. If you’re just making a few, the process goes much quicker. The croutons darken just a bit more after being removed, and if left in the hot pan, they will continue to cook and likely burn, so remove promptly from the pan. When finished, add in a few herbs and cheese, if you’d like and toss. If you prefer, cook a clove or two of crushed garlic as you heat your oil. Remove your garlic when it’s browned, before you add the bread. In a shallow baking pan toss bread with oil. Toss bread with cheese and bake in middle of oven, stirring occasionally, 8 to 15 minutes depending on size, or until golden. They may need to be turned, depending on size. Toss with herbs of your choice when pan is removed from the oven. Use a coupon matching site! Do not discount the savings! I check their site every week, even if I don’t “need” to go to the store and often find bargains I can’t pass up. This entry was posted in Click here for Fabulous Food Posts and tagged Bread, Croutons, Easy Recipe, Frugal Hausfrau, leftover bread, Leftovers, Salad. Bookmark the permalink. Hmm, can’t decide which one to try first. These look amazing. So many bread crumbs are dry and lifeless and not worth the carbs, if you know what I mean. Thanks for posting!